What Do You Do When God Doesn't Show Up the Way You Thought He Would? 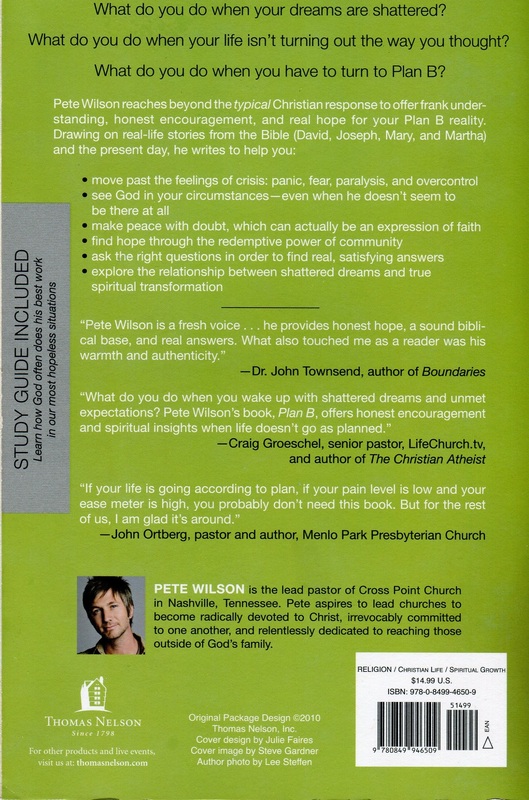 Plan B, by Pete Wilson is an inspiring book that talks about turning to Plan B when life doesnt go as expected. Pastor and author Pete Wilson helps you make sense of lifes frustration and disappointments using real life stories and biblical stories of men and women like David Joseph and Ruth. The Stories in Plan B remind you that god who created you and saw good in you will be there to the end and can guide you through the unfortunates and difficulties life throws at you. Plan B identifies our common responses to difficulties and offers hope, helping us to Understand what God might be up to, See how surrender helps us to receive God's plan, Embrace the community of believers and Reconcile a God of love with a life of tragedy and suffering. Pete Wilson points readers to the cross as not just the starting line but the centrepiece of our story with God and shares that it is there we turn in our Plan B and find the undeniable relationship between crisis and our hope followed by true spiritual transformation. "God wants to live inside the questions" says Wilson and then reminds us that "the cross is proof that He does not always change the circumstance but that He always has a purpose in every circumstance. He will never let go of us. He will hold us and His cross will be an anchor for us." Plan B by Pete Wilson was published by Thomas Nelson in May 2010 and is our 13456th best seller. 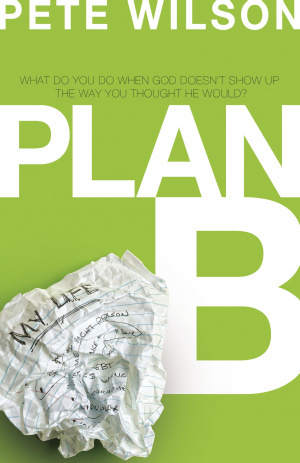 The ISBN for Plan B is 9780849946509. When I heard the summary of this book I knew it had a great deal of potential. I'm sure I'm not alone when I say that I didn't really plan to be sitting in the seat I am today, doing what I'm doing, at times things have seemed to all be going in the wrong direction and it's scary to be in the middle of that. Pete's book reminds us that God is in control, that some of His greatest work happens in us when everything around us, our plans and hopes, seem to be in shreds. I read the book in one sitting and found that not only is this new author a fantastic communicator, but also that his message in Plan B is one that lots of us need to hear. I recommend that anyone who's ever thought God, this isn't how it's supposed to be read this, even if you, like me, are out on the other side of those difficult uncertainties, this book will help with those What if? moments. I cannot recommend this book highly enough and am already buying extra copies to give away. It has really consolidated my thinking on the journey I've been on over the last 10 years. That nothing is wasted with God - no situation or event is beyond redemption - that everything (escpecially the worst parts) are used to bring Christlikeness. After having gone through infertility, two miscarriages, a nervous breakdown, a near divorce and a wife admitted to hospital with clinical depression I have found that God has used these situations to wake me up from my comfortable-can-do-fine-on-my-own existence and transform me into the person I am today. I would never want to repeat them, but I am grateful to God that he took whatever was necessary to change me from the selfish, frightened, addicted and arrogant man that I was. Pete opens his heart with gut-wrenching and brutally honest stories from his own and friends lives - he has walked the walk and doesn't offer pat answers or easy steps. But he does bring the light of the God of all help into where you're at. Don't hesitate in purchasing this for you or someone you love who is walking a tough road - and better yet purchase it ahead of time that you would understand that success in God's eyes is not how we would ever define success so that WHEN the storms come you are better able to co-operate with the work that he will do in you. Take a peek at some articles related to Plan B. Got a question? No problem! Just click here to ask us about Plan B.